I bought this new plaything at Summit Bike Shop in Bozeman, MT. It will take me about 4 months of riding to work and back before i start saving money on gas - 2 or 3 months if prices keep rising :). 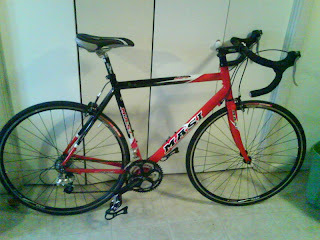 I have plans for this bike - I really do. I'm going to start doing some of the nightly rides the some of the bike clubs and shops put on, and hopefully do a couple longer tours this summer, as well as a triathlon or two - I would really like to be fit enough for a big triathlon at the end of the summer. Wish me luck!! !